Landslide susceptibility map delineates the potential zones for landslides occurrence. 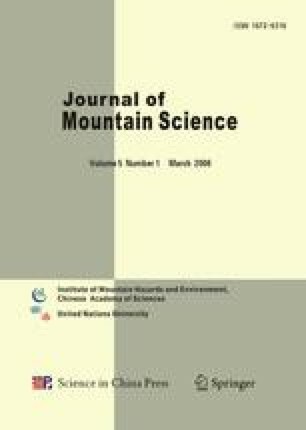 The paper presents a statistical approach through spatial data analysis in GIS for landslide susceptibility mapping in parts of Sikkim Himalaya. Six important causative factors for landslide occurrences were selected and corresponding thematic data layers were prepared in GIS. Topographic maps, satellite image, field data and published maps constitute the input data for thematic layer preparation. Numerical weights for different categories of these factors were determined based on a statistical approach and the weighted thematic layers were integrated in GIS environment to generate the landslide susceptibility map of the area. The landslide susceptibility map classifies the area into five different landslide susceptible zones i.e., very high, high, moderate, low and very low. This map was validated using the existing landslide distribution in the area.